This weekend we decided to have a large multiplayer game with two sides and 4-6 players. Each player made up a 750 point naval list. The night before I realised that we had 5 players, and so asked the Prussian player to double his list, making 1,500 points. Then on the day we rolled randomly to see which of the other players would be allied with the Prussians to make for a 2,250 points a side clash. As luck would have it, the Federated States of America was allied with the Prussian Empire against a force containing the League of Italian States, The Empire of the Blazing Sun and the Republique of France. 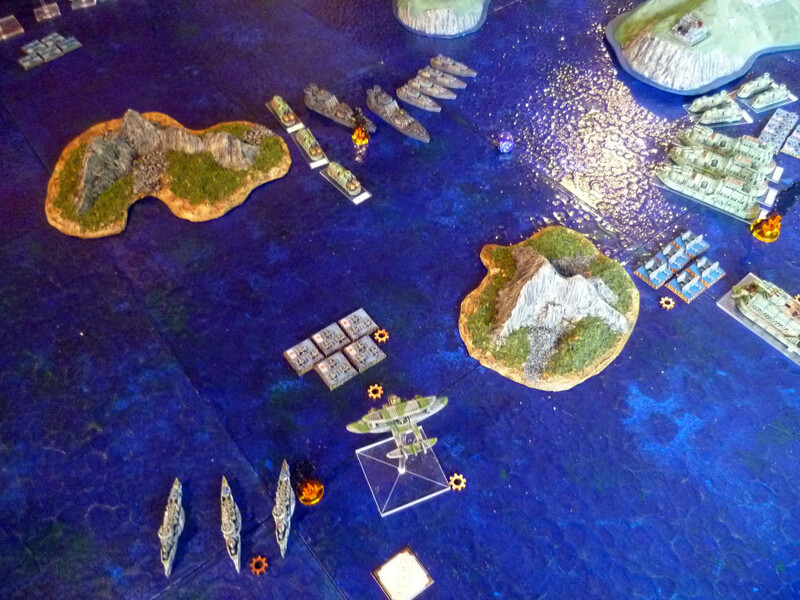 In the centre of the board, sheltered by ‘massive’ islands is the scenario objective, a large Oil Platform (which uses the Oil Platform statline from Hurricane Season, with the ‘volcanic base’ model from Spartan). To win the game, one side must capture and be holding the platform at the end of the game. If the platform is destroyed, or there are no AP from any nation aboard it, the winner is the side which has accrued the most Campaign Points. As with Prizes, the platform can receive AA support from a single nominated squadron from the side which controls it, if within command distance. As the fleets manoeuvred in the thin grey light of early morning, the order of battle became evident. 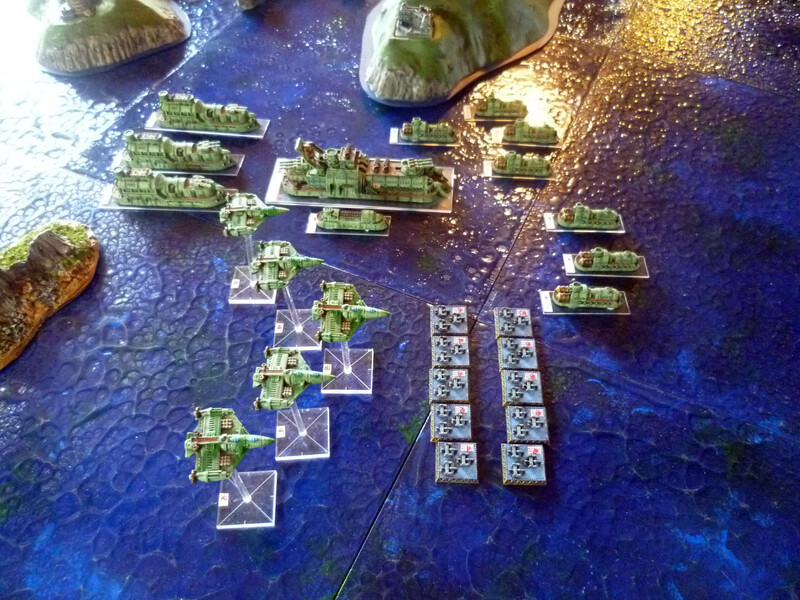 The Prussian Empire despatched a formidable air contingent to secure the oil platform, and hold one flank. Pflicht scoutships, teeming with Prussian shock troops, manoeuvred to seize the objectives, while a large number of smaller airships, backed by Grier bombers, destroyers and frigates, prepared to engage the bulk of the Blazing Sun naval force – a battleship, gunships and frigates supported by Italian destroyers and bombers. The Italians acted first, their Fortuna bombers dropping torpedoes which snaked a path to the Prussian surface ships, damaging a destroyer. Prussian Hussar Gunships surged forward, their opening volley claiming an Italian destroyer. Pressing their advantage, the Grier Bombers launched devastating electrical attacks against the bombers. While the shields of Fortuna bombers deflected some of the initial barrage, - one plane was engulfed in flames, and the tri-wing spluttered and smoked, before finally spiralling down into the sea. In return, the Italian destroyers and Blazing Sun Gunships pick off one of the Grier Bombers which fails to regain sufficient altitude to hide amongst the clouds. The damage aboard the bomber is severe, and many Prussians die trying to extinguish the terrible fire. 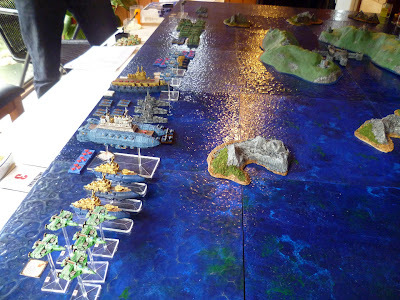 Prussian and Japanese surface ships both press forward to deny the channel to the oil platform to the opposing navy. 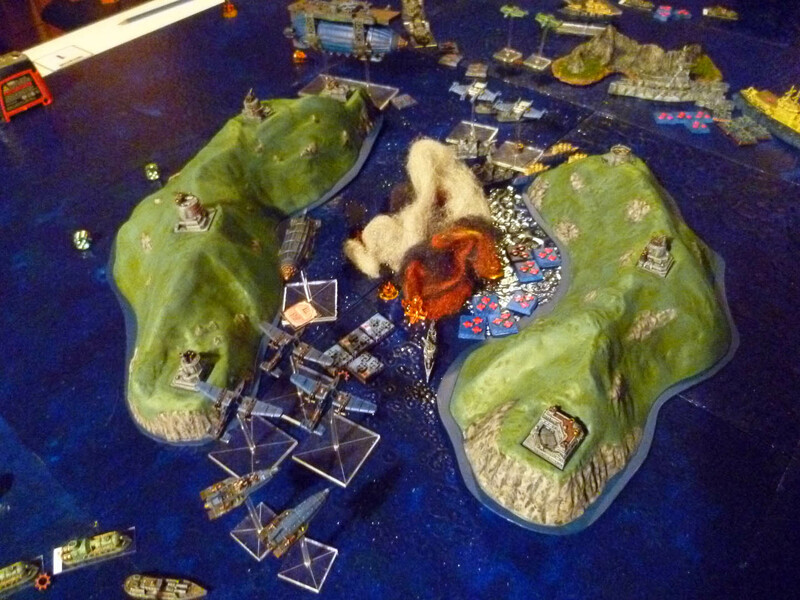 On both sides gunships engage in a brutal firefight, pouring shell after shell into the opposing ships at close range until gunships on both sides are burning. 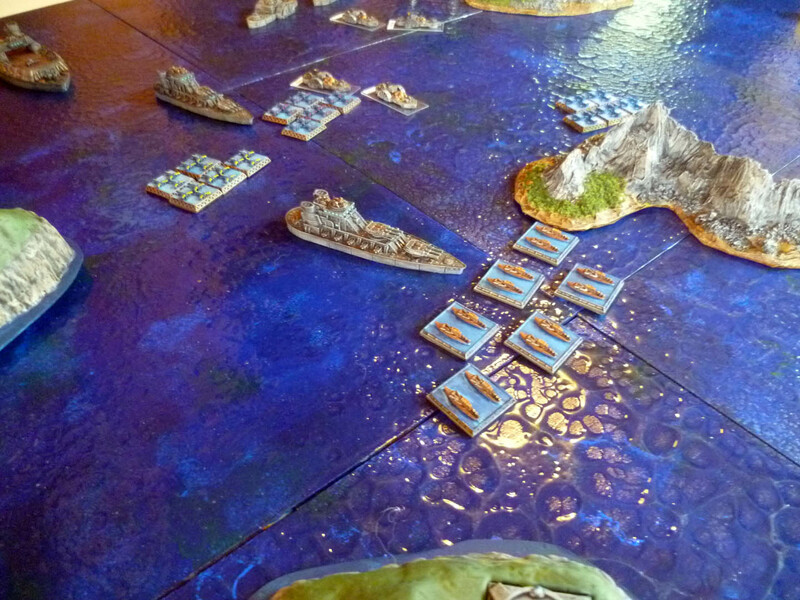 The Japanese order their frigates forward, to rake the Hussar Gunships with devastating broadside and turret fire, however, the Prussian response is decisive, Prussian frigates pick off the Japanese frigates at close quarters with ruthless efficiency sinking two and sending boarding parties to the others, leaving them derelict. On the other flank, Italian Motor Torpedo Boats speed forward, in a daring torpedo run against a Prussian Battlecruiser. The mighty Prussian ship is wracked by a series of explosions as the torpedos detonate, and momentarily winks out of existence, only to materialise moments later, mere feet from the small motor boats, causing them to bank sharply. The mighty Tourbillon airship exchanges fire with the American Valley airship, in a duel which lasts for several hours. 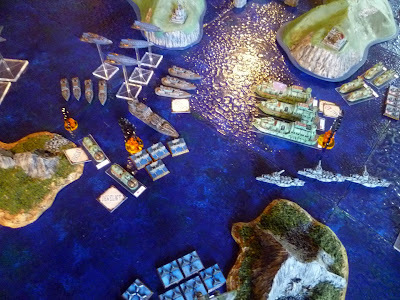 Meanwhile, Augusta frigates engage the French cruisers, covered by fire from the powerful turrets of Princeton gunships. Prussian and American Diver Bombers sweep down in a massed attack. 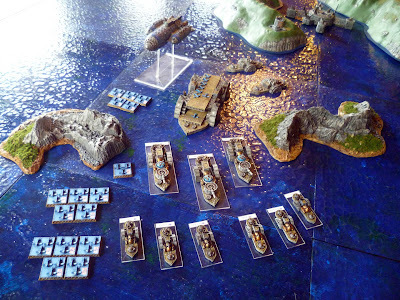 Volatire Heavy Interceptors, and French fighters thin their numbers, but enough torpedo bombers get through to cause significant damage on the massed naval forces. An Italian cruiser is engulfed in a tremendous fireball and several other ships are damaged. The French forces unleash a tremendous barrage, their fire directed against the ominous, sleek shapes of the Konigsberg Battlecruisers. The Battlecruiser which is already damaged by the Italian torpedoes succumbs, and is sunk, while the other burns fiercely. Boyed by this success the Italian motor torpedo craft launch another attack, this time against the huge, hulking, Rhine Fleet Carrier. Although their torpedoes strike home, and cause the great ship to lurch drunkenly, it contemptuously crushes many of the tiny craft beneath its armoured bow as it moves forward. 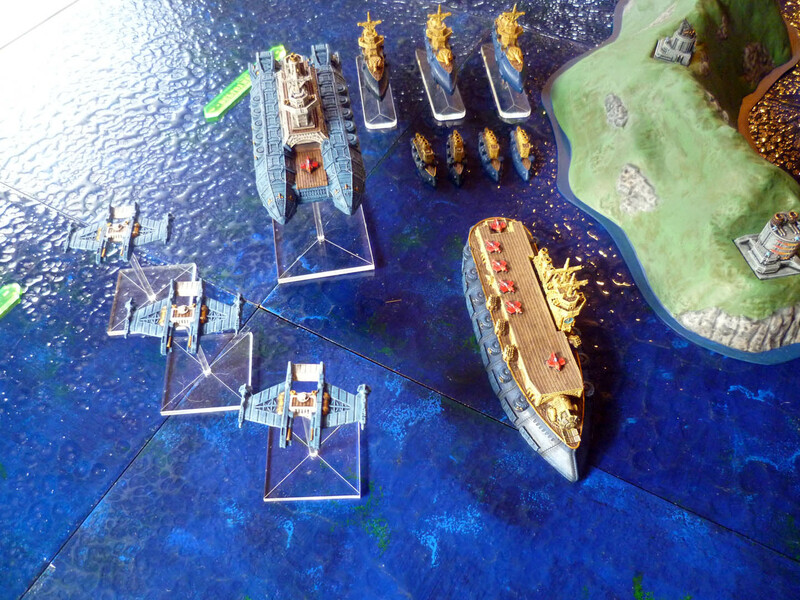 Meanwhile, the Prussian air flotilla strikes a decisive blow against the Prussian Gunships, their Speerwrf Light Zeppelins fire an electrified lance which penetrates the reinforced armour of one of the gunships, killing all aboard and sending the ship beneath the waves with a glowing blue halo. The remaining Italian destroyers sweep past the Hussar, and fire a single devastating salvo that tears apart the damaged gunship. In the air above, Prussian and Japanese fighters dogfight, and many aircraft on both sides are downed. A wing of Prussian fighters closes on the remaining Fortuna bomber, but the internal shield wards off the worst of their fire. 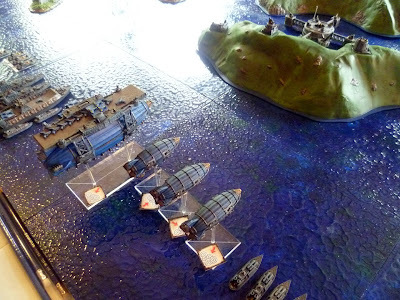 Italian fighters engage the Prussian small zeppelin and down a several. The Prussians now enact their main strategy. 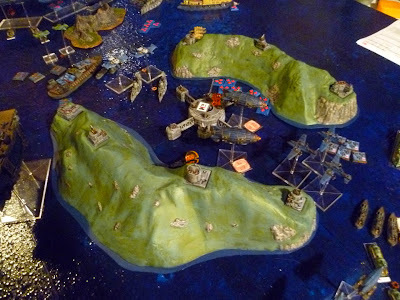 Pflicht airships descend over the oil platform and Prussian shock troops easily dispatch the crew, and take up defensive positions on the platform. The airships remain overhead raining fire on approaching enemies. French fighters and Tetsubo small flyers swoop into attack the Prussian zeppelin, raking them with fire until one of the Pflicht is sent, burning, into the sea. The remaining airships continue to support the Prussian Marines aboard the platform, although they are heavily damaged. 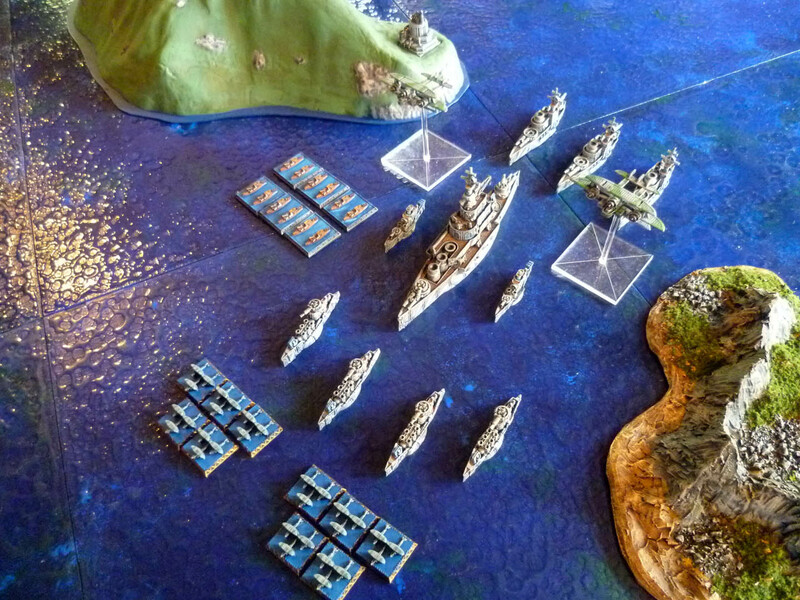 Realising they must try and take the oil platform from the Prussians before it is too late, the remaining Italian Cruisers enter the narrow channel and launch an attack using their elite marines. The fighting is intense and the Prussians take heavy losses, but the attack is repelled. 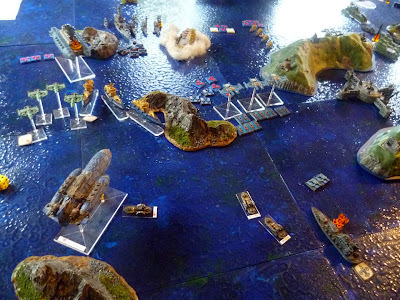 Now it is the turn of the French, a squadron of Lyon frigates send their rocket marines over to attack the platform, but the Prussians have reinforced their troops and while their losses are again heavy, they repel the French and retain control of the platform. 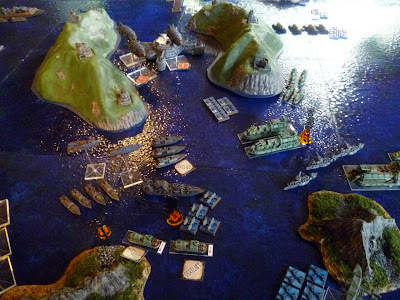 The Italian, French and Japanese commanders now realise the situation is desperate. They have no remaining way to capture the platform in time, so they resolve to destroy it and deny it to the enemy. The Japanese Battleship sets the platform ablaze with a ferocious volley from its main turrets, then the Italian Battleship, at the other end of the channel, opens fire with its rear main and raised turret. As the shells strike home, the entire oil platform erupts in a huge explosion. The other turret of the Italian Battleship lands a fatal hit on the Rhine carrier, and it too is destroyed. 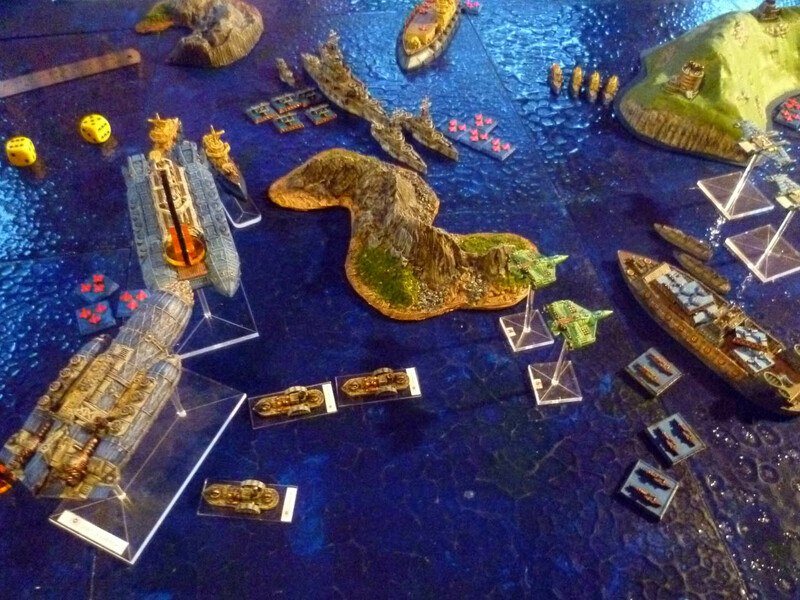 With the platform gone, the fleets begin to disengage, but the fury of battle has not yet dissipated. French marines launch repeated attacks against the damaged Valley airship, until they overcome all resistance and claim the Valley in the name of their glorious Republique. In retribution American forces send the damaged Tourbillon airship careening from the sky. Overall Result: Marginal Success for League of Italian States, Empire of the Blazing Sun and Republique of France.